The most advanced and powerful pre-heater for SMT REWORK and REPAIR offering full Process Control, increased rework speed, board protection and operator’s convenience. X-1003 Units are extremely accurate, have user adjustable off-set and unique acceleration mode to speed-up initial warm-up from room temperature. Built-in "K" thermocouple type temperature meter provides on board means for verification of actual rework process temperatures at the point selected by the user. The X-1001 Series Pre-heaters were designed to reduce the workspace required for SMT Rework and Repair. This design emphasizes on the appropriate process control for Rework and Repair. Pre-heater Units are microprocessor controlled to maintain accuracy and to extend heating element life. Microprocessor controlled by powerful firmware which, when up-grated, can be downloaded free of charge from x-kar or bokar websites. Close loop temperature PID control maintaining set temperatures with high accuracy and extending heaters life. XU-6 Board Holder (optional) is recommended for proper mounting and support of computer size or larger boards. X-1003 – Preheater 3.6 KW, Supply Voltage 208-240V. X-1003-06 -- Preheater with integrated XU-6 Board Holder, 3.6 KW, Supply Voltage 208-240V. Average PCB preheat time to 150°C Less than 2 min. Use of pre-heaters provides protection of the boards (and the vias inside them) against sudden thermal shock. Especially Large Boards are difficult to re-work due to deformation caused by thermal stress created by temperature differences between areas of the board. It is impossible to eliminate this deformation, but with proper preheat from the bottom of the board we can significantly minimize this deformation (buckling up or down etc.) 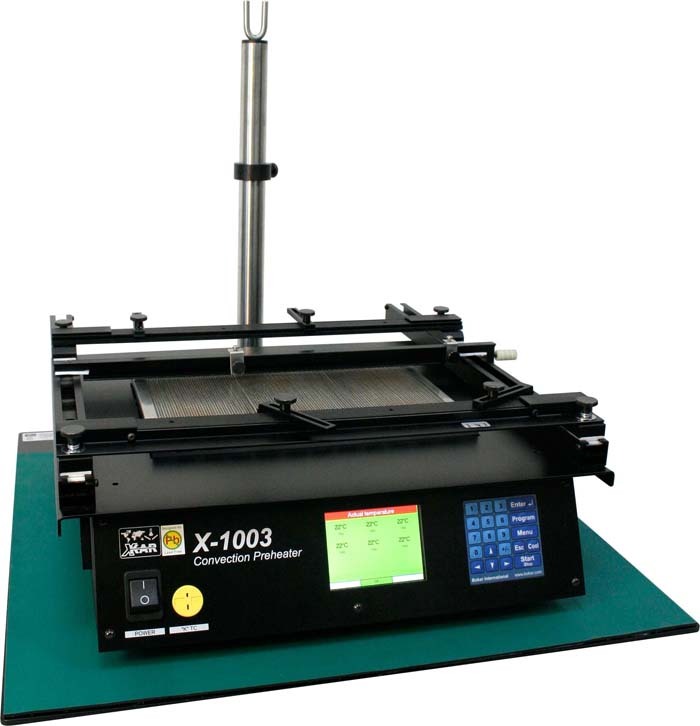 X-1003 has six powerful sections which can be activated simultaneously and individually adjusted to provide required heating under section of the PCB above them. For rework of the smaller boards the user can select one section or as many as are required for his size and shape of the PCB. Each of the six sections delivers 600W of power to cover area of 3 1/2 x3 1/2 inches. The unit can be ordered without the board holder or with XU-6, X-KAR board holder especially designed for this unit which allows you to mount 14" (360mm) wide and not limited in length boards (24” long do not require any extra support). Other, optional board holders are available like XU-7 Stainless steel quick change fixture accommodating irregular boards. The above picture of X-1003 shows the unit on the apx. 20" x 20" (50cm x 50cm) steel XKB Base lined-up for long term duty with ESD Rubber no-burn mat. The picture also shows XK Column which can be purchased as a part of XK Tool holder, if the pre-heater is going to be used as a part of the Rework System using Top Heating (Like X-FineRework or similar). Powerful Pre-heater will also allow you to rework high mass boards, which have through hole components like connectors etc. (you must use proper pre-heat temperature which is lower than the maximum allowable value for the plastic from which your connectors are made). less time consuming and properly done to guarantee appropriate process control.